In this episode we’re going to look at a gem called decent_exposure. This is a simple gem with a nice concept. We can use it to create an interface of methods in the controller that the view can access instead of using instance variables. The gem uses a method called expose to define this interface. Before we look at decent_exposure we’ll try applying this concept manually. The application we’ll be working with is a simple blogging application with many Articles, each of which can have many Comments. The ArticlesController contains pretty standard controller code. For example in the index action it creates an instance variable called @articles. In the index view code we then use @articles to loop through each article and render it. When you first start using Rails it may seem strange that access to a controller’s instance variables is shared with the views as these are usually kept private within a class. We’ll take a look now at an alternative approach that shares data by exposing methods to the views. To accomplish this we’ll create private methods in the controllers that return either single models or lists of models. First we’ll remove the line of code that fetches the articles from the index action and put it into a method called articles. We want @articles to be used as a cache so that the articles are only fetched once. We can use the ||= operator to achieve this and we won’t now reference this instance variable anywhere else in the controllers or views. We’ll make articles a helper method so that we can use it in the views. In the view we can now replace the call to the instance variable with a call to our new articles method. If an id parameter exists then the method will find the Article with that id. If not then it will create a new one based on any article parameters. We now have a method that we can use to replace the @article instance variable and so we can remove the line in each action that finds or creates an action. redirect_to articles_path, :notice => "Successfully created article." redirect_to articles_path, :notice => "Successfully updated article." redirect_to articles_url, :notice => "Successfully destroyed article." We won’t show the other views but we’ll need to change them in a similar way. Another advantage of this approach is that it gives us lazy loading. If we were add action caching to, say, the show action, then the article that is being shown will only be fetched from the database if we’re going to render the view; the article isn’t required in the controller layer. Action caching works well here as the action isn’t fetched unless the controller truly needs it. We have a good solution now but it would be even better if there was a more convenient way to define the methods that we expose to the view and this is where decent_exposure comes in. We can use its expose method which will define methods that expose models to the view in a similar way to the articles and article methods we wrote above. The expose method has some useful defaults: it will search for a model by its id parameter and if that isn’t available it will build a new model using any appropriate parameters it can find. This means that we can use the default values for finding or creating single models. If we require any other behaviour we can pass a block to the method and define it there. Caching will be handled automatically for us by decent_exposure. Let’s try using it in our application. First we’ll need to add the gem to the Gemfile and run the bundle command. We can now replace the article and articles methods we wrote in the ArticlesController with two calls to expose. The defaults that expose uses are correct for a single Article but if we want a list of articles we need to supply the custom behaviour to get those so we’ve copied it from the articles method and placed it in expose’s block. If we reload our application now it’ll work just as it did before, but the controllers are much neater as they’re using the methods supplied by decent_exposure instead of instance variables. 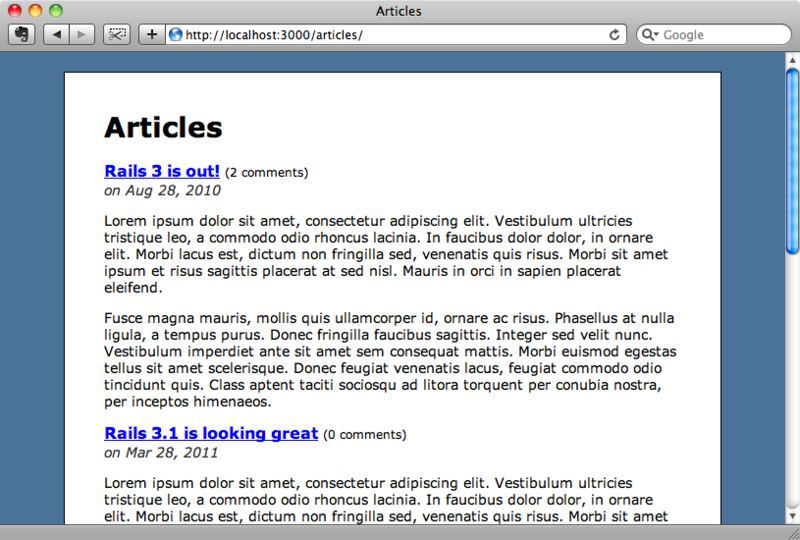 How does decent_exposure handle nested resources such as the comments in our application that are nested under articles? redirect_to @comment.article, :notice => "Successfully created comment!" We’re still using instance variables here. At the top of each action we fetch an article and then fetch or build a comment through that article. We can use decent_exposure here as it fully supports nested resources. redirect_to comment.article, :notice => "Successfully created comment!" As we did when we changed the ArticlesController we’ll need to update the views related to this controller so that they call the methods generated by decent_exposure instead of the instance variables, such as in the form partial below. When we try the application now it still works as well as it did earlier but the code in the controllers is much improved. There’s one potential gotcha with decent_exposure that we need to be aware of. When we use expose with its default behaviour to fetch as single model it will look for a pluralized version of the name that is passed in (e.g. :article) and attempt to fetch and build records through that scope if it’s available. For example, let’s say that we have the following two calls to expose in the ArticlesController. Any call to the singular article method will try to fetch an article based on a plural articles scope so, given the code, above when we look for a single article it will only be returned if that article is visible. If we don’t want this behaviour then we’ll need to change the name of the pluralized version so that it has a more descriptive name. In this case we’ll rename it to visible_articles. Now the second expose call is no longer considered the base default scope that member actions are built on. Once we’ve made a change like this we will of course need to change any calls to that method in the views. If we ever need to change the expose method’s default behaviour we can do so by making a call to default_exposure and passing it a block. The behaviour we define in that block will override the default behaviour. The name passed to expose will be passed to the block in default_exposure. We generally won’t need to override the default but the option is there if we ever need to. That’s it for this episode. It’s a neat solution for cleaning up controllers and well worth considering if you think it’ll fit in with your workflow.